Reconditioned product, with full 90 days warranty. Sealed into a clamshell with power adapter and operating manual. Lift and Cut Technology, with 45 lifters and 45 rotating blades shave hair below skin level. Self-sharpening Blades extend the life of razor heads. 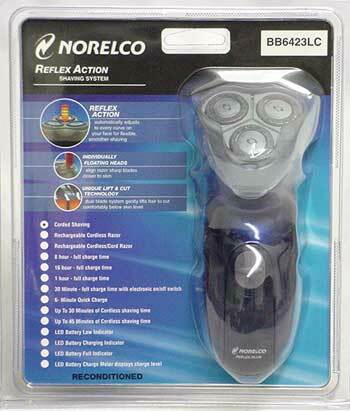 Reflex Action automatically adjusts to every curve on your face. 6.3L x 3.94W x 9.45H inches.